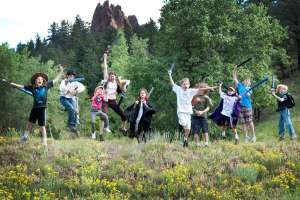 Since 1995, Renaissance Adventures has led summer quests where the kids become the heroes of a dynamic and exciting adventure. It is not a summer camp but a week-long experience that is fun and extraordinary. Each week is a different quest with its own plot, theme, and challenges. Participants choose mythic archetypes and powers, band together as a team, solve riddles and dilemmas, negotiate treaties, interact with interesting characters, and swashbuckle with foes using safe foam swords. In small groups of about six children, everyone gets a chance to shine and be the hero of a mythic quest! 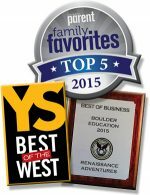 Voted “Best Summer Camp” two years in a row (Yellow Scene’s Best of the West Award), “Top Five Summer Camps” (Colorado Parent’s Family Favorites Award), and numerous mentions from newspapers, educators, and of course, parents and kids, it’s no wonder why we have been a favorite since 1995.